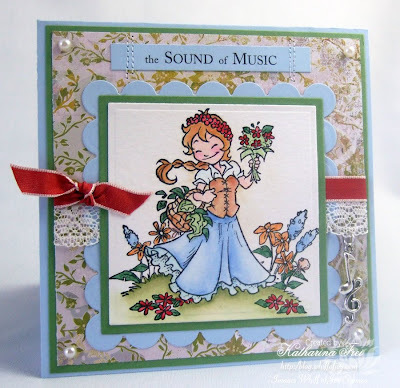 "Music or dance" is this weeks theme at the Cute Card Thursday challenge blog. Perfect!!! for another preview of the new Whiff of Joy stamps, which will be released this saturday! Maid Charlotte dancing on a hill of flowers (WoJ fall grass designed by Elisabeth Bell). I stamped Charlotte on 300g watercolour paper, masked her and stamped the fall grass right over her, with the help of my stamp positioner. Magd Charlotte, wie sie auf einem Hügel voll Blumen tanzt (WoJ Herbstgras designed von Elisabeth Bell). Ich habe Charlotte erst auf 300g Aquarellpapier gestempelt, dann maskiert und dann das Herbstgras mit meinem Stempelpositionierer darüber gestempelt. This is how my "mask" looked. 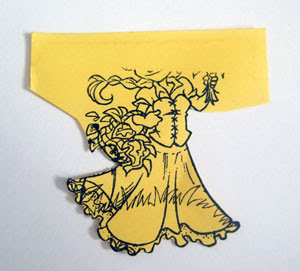 I wanted to do it really fast, so I just stamped Charlotte on a Post It note and just cut around the lower part of her body. So schaute meine "Maskierung" aus. Es sollte sehr schnell gehen, deswegen habe ich Charlotte einfach auf eine Post It Note gestempelt und dann nur um den unteren Teil ihres Körpers herumgeschnitten. The sentiment is created on the computer. I coloured Charlotte with water- soluble pens, Twinkling H2Os, watertank brush and glitter pens from Spica ( I bought them at Ellen Hudson's). Thanks for stopping by and don't forget to join this weeks Cute Card Thursday challenge! Danke fürs Reinschaun und vergeßt nicht an der Cute Card Thursday challenge teilzunehmen! Paper: Basic Grey (Perhaps), SU cardstock "Wild Wasabi & Bashful Blue"
Stunning card Katharina, and another beautiful stamp. Oh, how I love your stamps! die Karte ist ja wieder ein Traum. Ich bin total hin und weg! Oh, I really love that stamp! Beautiful card and fabulous colouring, as always! Great background paper. The Sound of Music is a great musical and the card really reminds me of it. Oh, ist der stempel süss!!!! Super mit dem hintergrund. deine Karte sieht ja allerliebst aus, kann mich gar nicht satt sehen. Bin ganz hin und weg vom Motiv, das ist wunderschön. very awesome card! Love the charms! Auch ich bin begeistert und ich werde auch im Shop sein!!! Oh Katharina, Deine Karte ist wieder ein Traum. Wunderschöne Szene und traumhaft schön coloriert. A gorgeous card Katharina! Love that image!! The Sound of Music is a great movie!! Oh ist das Mädel süüüüß! I loooove the Sound of Music, we watch the movie every xmas as a kind of tradition;o) You've made such a stunning card with this cute stamp Katharina, gotta have her! She's lovely. ist das ein süßes Motiv und eine super Karte. Oh I love this!!! These new stamps are sooo fun! woww Katharina,what a gorgeous card. Great comparison with the film, absolutely love how the masking was done and what an achieved look to this creation. Fab! 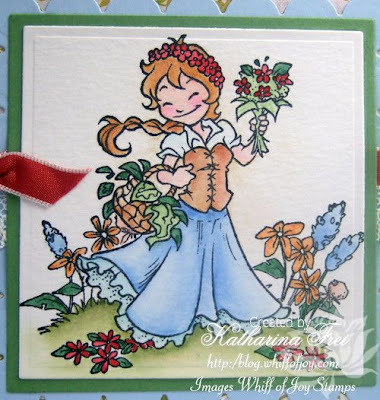 Oh wow Katharina she is wonderful as is your card too hun.. looking forward to the new release - gorgeous, gorgeous !! Wow, this is absolutely stunning!! I love the image. ah ah, la Mélodie du Bonheur, je pense que tu regardes trop la télé en Suisse !!!!!!!! Ta carte est splendide et ce nouveau tampon aussi !!!!! Wonderful card Katharina. Love the coloring and the sentiment is perfect. Your card is beautiful Katharina and such a great idea for this challenge, I recognised Maria on the hill as soon as I saw it! Fabulous stamping too! Another lovely one - card and stamp! This stamp is soooo cute!! I absolutely love it!! 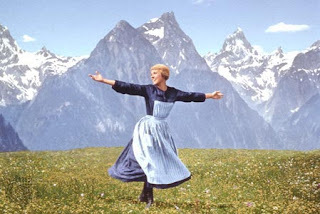 Great take on that classic shot from The Sound of Music. Your coloring is perfect. Whilst I love your card...I DETESTE 'The Sound Of Music'. Three years of taking senior citizens on coach tours around Salzburg,whilst listening to the soundtrack, will do that to you! However, Salzburg is still my favourite place in the whole world, and I miss it every day! Gorgeous Katharina!! Love the charms!! This is stunning!! So beautiful!! I love this image. So sweet and pretty! I love this Katharina ! And thanks for the tutorial on how you made it !